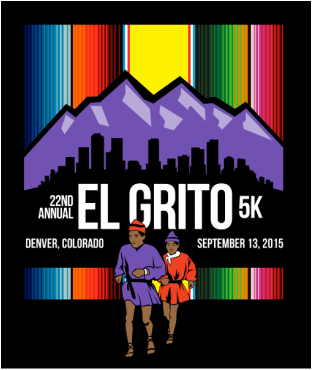 Founded in 1994 by a group of local runners, El Grito 5 is a community focused family event celebrating culture and fun through running. El Grito seeks to inspire young athletes to pursue college education and provides scholarships for graduating high school seniors who have demonstrated involvement in track and cross-country running. The Colorado Running Club is the host of the event. This club is dedicating to helping athletes take their running performance and vision for their lives to the next level through running. 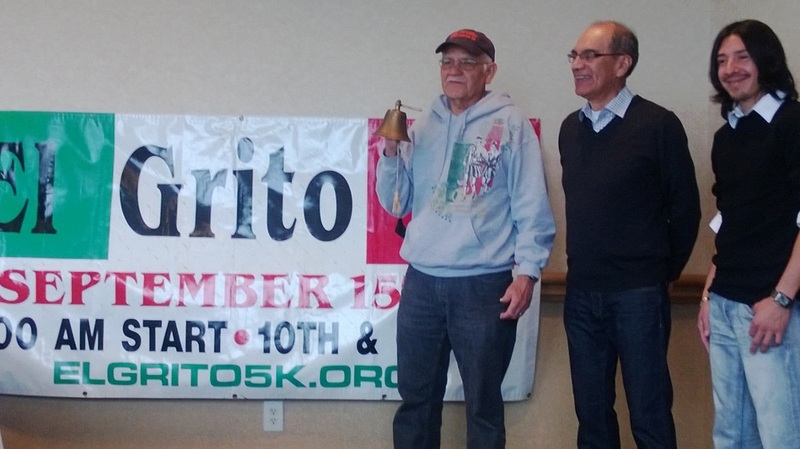 El Grito 5k co-founder, Rich Romero rings the bell to signify passing the tradition to Coach John Perez and Colorado Running Club runner Lonnie Cruz. The logo depicts two Tarahumara runners from Mexico running in the Leadville 100 in 2004. Famous for their incredible endurance, the Tarahumara word for themselves, Rarámuri, means "runners on foot" or "those who run fast" in their native tongue. The 2015 custom logo created for the t-shirts and winner tiles.